YOU PUT WATER IN A BOWL AND DROP RANDOM COLORS OF NAILPOLISH - ProudMummy.com the Web's Community for Mums. YOU PUT WATER IN A BOWL AND DROP RANDOM COLORS OF NAILPOLISH IN IT. 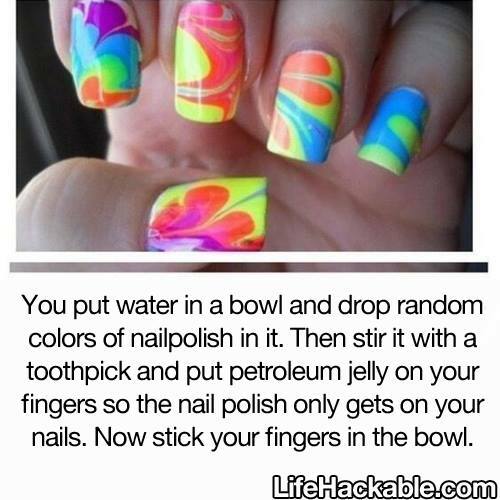 THEN STIR IT WITH A TOOTHPICK AND PUT PETROLEUM JELLY ON YOUR FINGERS SO THE NAIL POLISH ONLY GETS ON YOUR NAILS. NOW STICK YOUR FINGERS IN THE BOWL.